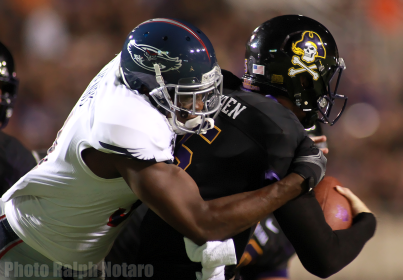 FAU's first taste of Conference-USA football didn't end favorably. The Owls managed to compete for a quarter and a half against ECU, before an offense that featured a two quarterback rotation gave way. Neither Jaquez Johnson or Greg Hankerson could make a difference, as the duo turned the ball over three times in a 31-13 loss. "They just have to grow up more quickly than they already are,” head coach Carl Pelini said of the two. It was the type of environment that comes with a new conference: a Thursday night nationally-televised showdown in front of a hostile crowd in Greenville, N.C.
Johnson was awarded his second career start, but the sophomore couldn't escape his opening jitters. He failed to settle in the pocket and hesitated to read through his progressions throughout the night. Hankerson split series with Johnson, and was equally as distraught, throwing an interception on an a errant throw to the sidelines before fumbling later in the game. ECU (2-0, 1-0) was quick to find it's offense and scored on the opening drive of the night with an 18-yard touchdown pass from Shane Carden to Davon Grayson. FAU (0-2, 0-1) would supplement the scoring with a pair of field goals from Mitch Anderson, but after that, the momentum took a turn for the worse. Carden tossed his second touchdown of the night, as Hankerson's interception led to a 7-yard touchdown run for Vintavious Cooper. FAU couldn't move the ball with either Johnson or Hankerson, and had just five first downs in the opening half of play. ECU led by three scores at halftime, and displayed the physical type of football it takes to win in C-USA – as they never looked back. The Owl’s offensive line gave up six sacks in total, and failed to effectively protect the two quarterbacks in the second half. Anderson missed two field goals, and Johnson threw an interception. FAU totaled just 282 yards of offense, and had 178 yards passing against a defense that gave up 38 points to FBS-transitional Old Dominion last week. Johnson threw for 62 yards, while Hankerson scored the team’s lone touchdown with a 2-yard pass to William Dukes in the final two minutes. The freshman finished 14-of-26 passing for 116 yards and saw a majority of the work in the second half. The Owl’s defense was serviceable against the up-tempo ECU attack, but without offensive support – it didn’t matter. Cory Henry (pictured) picked up his second sack of the season, as the line produced their first multi-sack effort in six games. The loss moves FAU to a 1-17 mark in their last 18 road contests. The Owls will have nine days to prepare for their next opponent in USF.